The offer is extended until 29.11.2018 !!!!!!!!!! 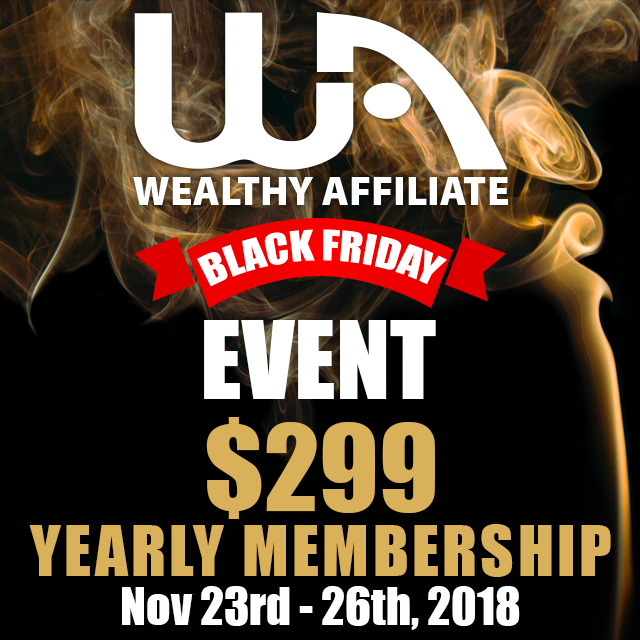 Black Friday is coming and it means that Wealthy Affiliate is providing their yearly premium membership for only $299/year = less than $0,82 per day! I am more than happy to be a premium member on WA and I have been here for almost 3 years. Now I am going to give you a few reasons why I highly recommend you to take advantage of this great Black Friday offer. I talk from my own experience. Wealthy Affiliate is an affiliate marketing training platform which has over 13 years experience of affiliate marketing and online business. WA has developed the platform continuously and ambitiously. Wealthy Affiliate has evolved into what I believe to be the absolutely authority in affiliate marketing industry. This is the first level of the training and it is structured to take you from a complete beginner, all the way to having your own website up and running already. Once you have completed all 10 lessons, each of with comes with their own videos and daily tasks (about 3 a day), you are ready to progress to the second level of training. In this stage you already have your website set up and ready to start making money. I don’t go to the details of each lesson or level but I tell you what they are all about in general. This is the second ‘major” course you’ll find inside Wealthy Affiliate and this one will show you how to start your business promoting Wealthy Affiliate and the affiliate marketing niche in general. The Affiliate Bootcamp Course may look similar to the “Online Entrepreneur” course (OEC), and you’re right; the first one is but these lessons are much more detailed and direct as you know what you will be promoting (i.e Wealthy Affiliate). WA offers comprehensive training, 2 main courses with 120 lessons in total. But this isn’t enough in addition to that Wealthy Affiliate also has 13 different classrooms brimming with additional courses, guides and training. This is where you will find a collection of tips, advice and commonly asked questions regarding a specific topic. Here’a a screenshot of a few of the classroom topics. Every Friday evening, Jay (@magistudios) – one of WA’s leading members – gives us a “live class” webinar. There aren’t those free ones you find online where half of the time is spent on introduction and the rest pitching you a product. Jay’s webinars are hour-long real and up-to-date information with a live Questions&Answers at the end where you can ask what ever you want about the topic of the day. The great thing is that the webinars are recorded and available for replay when it suits you best. I would like to point out one example which is Site SSL (HTTPS). SSL( SecureSocketsLayer) in extra SitePlus+ services allows a website to transfer data over an encrypted connection. You detect it from ”https://” protocol before your domain name. In practice, this means more website security and trust towards your website. Other web hosts may charge you of SSL between $50-$100 per year plus setup fees, but at Wealthy Affiliate its included the monthly or yearly fee. Wealthy Affiliate has its own domain name registrar called SiteDomains. In my opinion SiteDomains is better than such a domain registrars as GoDaddy and Namecheap. I justify it by that SiteDomains offer free 100% security and back ups, free speed boost and even free site emails (name@yoursite.com) all of which would cost you ~ around $50 per month if it weren’t for SiteDomains. The cost of buying a domain at Wealthy Affiliate is $ 13.99 per year including all the earlier mentioned services. Wealthy Affiliate was founded 2005 as a keyword research tool program. The founders Kyle and Carlson has made Wealthy Affiliate a leading affiliate platform within the industry during the last 13 years. It has been happened through continuous development of operations and excellent anticipation of what will happen in the industry. All the driving force behind the function has been customer-oriented thinking. All the time Kyle and Carson have been developing the company the best for customers and listened to their wishes. One indication for that is that the price has remained at the same level throughout the company’s life cycle. One of the reasons why Wealthy Affiliate is so popular is that the founders Kyle and Carson are actively and prominently involved in daily activities. They are providing support, engaging with members, giving advice and answering community questions. It’s not common in online business world and that’s why it is very special for all Wealthy Affiliate’s members. The possibility to ask questions and getting one-to -one mentoring and coaching from the founders is very exceptional and rewarding for all of us here at Wealthy Affiliate. This isn’t any dribble but you can really contact Kyle and Carson through their profile pages and you will definitely get the answers you need and even very quickly. Many Wealthy Affiliate members have earned immense fortune through affiliate marketing and a large number have been able to fire their boss and gain good regular income by working as an affiliate marketer at Wealthy Affiliate. Here are some of the Wealthy Affiliate success stories. 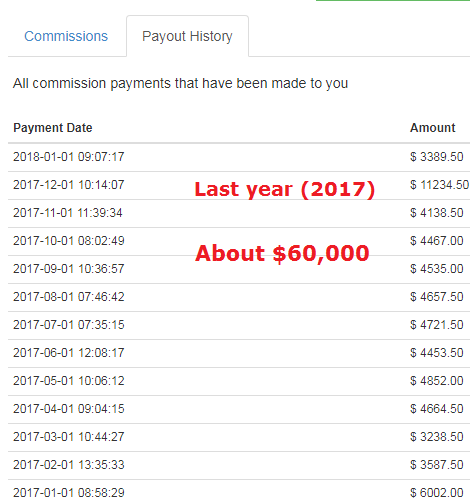 As you see the members of Wealthy Affiliate has been very successful. This fact is a proof about that Wealthy Affiliate offers such tools and framework for affiliate marketers that they really can succeed in affiliate marketing. This will be also the case with you, if you give yourself a try. The normal monthly payment for the premium member is $49. It’s $588 per year. Taking this Black Friday offer your yearly costs are $299. You save $289 a year with this great offer! Think about it. You get all the tools and training described in this article $ 0.82 a day. Don’t hesitate, the offer is valid only 4 days, 23.11-29.11.2018. Not to mention, that it has been added an incredible amount of updates to the community in 2018, making the $299 per year offer even a better deal than in past years. New tools and updates are coming also in 2019. The year ahead within Wealthy Affiliate will give you many new things to develop your own online business. The following new tools and updates will be available for Premium members in 2019! **Full-Time Revenue Opportunities Directly Within WA. You get straightforward into Premium member page and all you have to do is to insert your username, email address and password and you are good to go! Wealthy Affiliate is a vast community and a very social one. 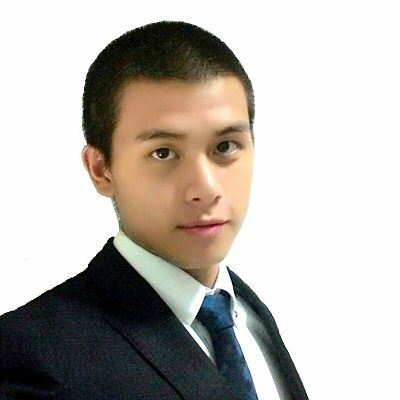 For communicating within the community you have to create your own personal profile just as on typical social networks. Your personal profile allows you to follow other affiliates and to participate in the debates within the community. Fill out your bio telling us what you’re all about, add a picture of yours and so you are able to receive and send comments/messages with other members. You can take a username or use your real name in your profile. 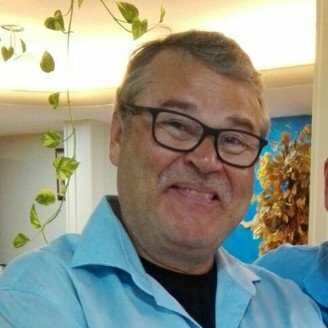 When you become a member, you will also receive a few welcome messages from members, including me and also from Kyle or Carlson(WA founders) as they always want to welcome everybody in. On the left side of your screen, you will see the “Training” button which would reveal the Online Entrepreneur Course and the Affiliate Bootcamp courses mentioned above. You want to start with the OEC first (unless you plan on promoting WA from the get-go). Whatever it is you decide to do, focus on that and only that for the first couple of weeks. Whichever one you pick, you’d be done with the first level of training in about 10 days (10 lessons). Work. Work like you actually want it because the benefits of having your own online business are incredible. It won’t be easy every day, but with the in-depth video training and the largest community of affiliates online all ready to give a helping hand, I am sure you’ll find your way and I cannot wait to see your own “Wealthy Affiliate Success Story” post.